Extrusion is the process of obtaining the profile having the shape of the mold by passing the aluminum billet through the steel molds with the great force provided by the press. Aluminum extrusion is made hot. 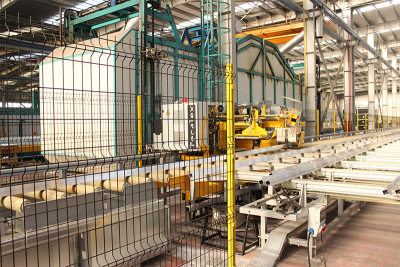 Billets are heated at 420-520 ° C, molds should be heated to 450 ° C and the temperature of the extruded profile is above 500 ° C. The extrusion profile is cooled, cold stretched and cut to the desired length. Heat treatment is then applied to the profiles. During this process, the profiles are kept at 185 ° C for 5 hours. 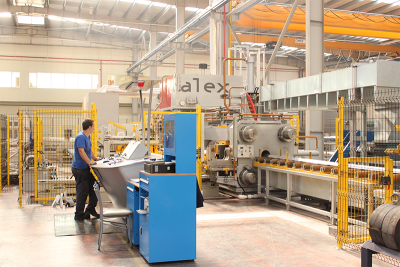 In our factory, we meet the demands of different sizes of profile production in our presses with 6 different forces and sizes including 2 6 inch 1250 tons, 1 7 inch 1650 tons, 2 8 inch 2700 tons and 1 10 inch 3500 tons. In our factory, which has a monthly production capacity of 3,500 tons and annual production capacity of 42,000 tons, it is possible to produce with special alloys such as EN AW 1050, 1070, 6060,6063,6463-6005 as well as EN AW 6082. 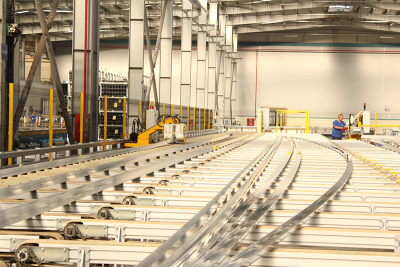 In a wide range of products, the production of aluminum profiles for various sectors and applications is carried out on our extrusion lines.